Two iconic junior tennis events are underway this week. Kalamazoo, Michigan has been the site of the USTA National Boys 18 & 16 Championship since the 1940s. Every notable American male has competed in this event, from Arthur Ashe and Stan Smith, to Jimmy Connors and John McEnroe, Pete Sampras, Michael Chang, Jim Courier, Andy Roddick and hundreds more. Meanwhile, 2,200 miles west, San Diego is home to the USTA National Girls 18 & 16 Championship. Though only played in San Diego since 2010, this tournament too boasts a deep tradition, its competitors including Billie Jean King, Chris Evert, Tracy Austin and Lindsay Davenport. The energy around these tournaments is incredible. Everyone entered is highly skilled, each likely to play Division I college tennis. Some are grateful late-bloomers, their hard work at last earning them precious spot. Others are seasoned veterans, longstanding juniors who’ve played these events at every age level. And others are the stars, the ones who draw attention not just from college coaches, but from agents and marketers who come with opportunities and, most of all, the big question: Should that great junior turn pro? That question is particularly resonant in San Diego. Such is biology that women physically mature faster than boys. Fast-track junior girls often eschew college. 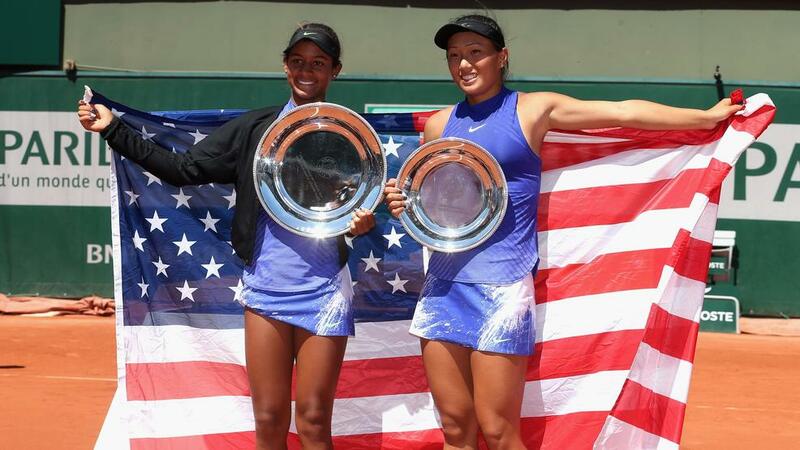 This week in San Diego, those likely pondering the big leap include Whitney Osuigwe of Bradenton, FL, who this spring became the first American woman to win the Roland Garros juniors since Jennifer Capriati’s 1989 run; and Claire Liu (Thousand Oaks, CA), the first American woman to win the Wimbledon junior title since Chanda Rubin raised the trophy in 1992. The winners of these events will earn wild cards into the US Open. Playing in New York will surely give each player an instant read on where his and her skills stand. But the decision to go pro is a complicated one. Various factors – from age-eligibility rules to improved fitness to increased prize money – have sharply curtailed the presence of teenagers among the elite. But is college tennis best for life balance or for skill-building? This is the question Osuigwe and Liu are currently grappling with. The thinking here is that each will eschew college tennis and by 2018 be competing regularly on the WTA.